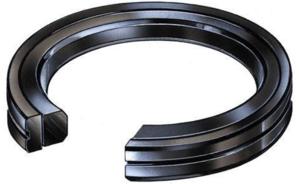 Sheffer's standard piston seal option on our HH and MH hydraulic series is a slipper seal. A slipper seal is a square cross-section, bi-directional seal made of glass filled Teflon. Since Teflon does not naturally return to its original shape, the slipper seal has a Buna-N O-ring between it and the piston to push the seal outward to make continuous contact with the ID of the cylinder tube. The rest of the OD of the piston has bronze filled Teflon bearing strips to keep the piston centered in the bore while also providing a bearing surface for the piston to prevent metal on metal contact. A common piston seal option on hydraulic series cylinders is a lip seal piston. A lip seal piston has two polyurethane, uni-directional, rectangular cross section seals back to back that prevent bypass from each side of the piston. As the pressure increases in the cylinder it expands the sealing lips outward to create an even tighter seal. A lip seal piston is recommended in load holding applications as it does not leak over time. With a lip seal piston the pressurized side of the cylinder can be closed off, the hydraulic system shut down, and the cylinder will maintain pressure over time, whereas with a slipper seal piston may experience some bypass and thus loss of pressure or drift over time with the hydraulic system shut off. Another option on hydraulic series cylinder is a U-cup piston. It is similar to the lip seal piston in that it has two uni-directional seals except that they are made of Buna-N material and are a square cross section seal. In order to avoid seal extrusion, the U-cup seals have Teflon back up rings. The U-cup seal works like the lip seal in that the seal lips expand as the pressure against the seal face increases. The U-cup piston is the only sealing option available on Air type cylinders. The final option on hydraulic series cylinders is ring type piston. A ring type piston has cast iron rings as opposed to a polymer seal, and these rings do allow some bypass. While piston rings are older technology, cylinder designers select ring type pistons when bypass is not a concern, or higher speeds or temperature ranges are needed as the friction between the rings and the cylinder tube is minimal, and they are not damaged by higher fluid temperatures. While Buna-N and Polyurethane are standard piston seal materials, Sheffer makes Viton available as a seal option on all cylinder series. When Viton is selected as a seal material, all cylinder O-rings and other polymer seals such as rod seal and wiper are replaced with identical Viton versions of those seals. Only the glass filled Teflon slipper seal remains without being changed to Viton. A cylinder designer may choose to change to seal material due to higher temperature operation, or they are using a fluid that is not compatible with polyurethane or Buna-N. While choosing the correct sealing system for a cylinder is important, the standard options work well in most cases, in the cases that the standard options do not work there is an option that will.